If you’re a writer and want to be published, you need to be able to accept rejection–it’s part of the process. Recently I spoke to a short-story writer who once visited a critique group I belong to and I asked him what he was doing with his writing. He said he no longer sent it out because he didn’t like being rejected–so he only shares his stories with friends. This man is an excellent writer–though his stories had some flaws. As I look back, I remember that he didn’t like having his work critiqued either and that’s why he didn’t continue on with our group. I think what he’s decided is sad, because eventually he’d probably have found a market for his work and more than just his friends could’ve enjoyed it. I knew another excellent writer who sent her manuscript to about three publishers or agents, was rejected and that was the end of her sending out her work. Oh, she still writes–but she doesn’t ever submit her work. She is able to take criticism in a writer’s group and make suggested changes or rewrites. When I taught a weekly writing group, at times I’d get a new student who would read their few pages and be horrified when I pointed out problems. Made me wonder why they bothered to come. Believe me, when I’m critiquing anyone’s work I always talk about what is good first before giving any suggestions. Frankly, I don’t understand the mind-set that can’t take criticism or rejection. My first book was rejected nearly 30 times before it was accepted by a publisher. Each time it was rejected, I worked on it some more. At the time I didn’t know nearly as much about editing and rewriting as I do now. Even though I now have over twenty published books, I still attend a weekly critique group. I would be disappointed if they didn’t find something to help make the book better. I use my fellow authors as a first editor. Rejection is part of getting published. Never take it personally. It can mean many things, the publisher or agent was having a bad day, they are interested in a similar book already, it isn’t the kind of book that they like. Always pay attention to what is in the rejection letter, especially if it’s handwritten and has some actual comments about your writing. No matter what happens, work to fix that book or move onto another. Never, ever give up. As usual, as it becomes time to write my blog, I wonder what I’ll write about. Today, I’ll be talking about something only vaguely related to writing. Recently, I presented two workshops with a writing partner at a writers conference. Both presentations were exactly what was advertised. In the morning we gave a talk on marketing, what that meant and ways of doing it, and the fact that most publishers today want a marketing plan submitted along with a query. Our afternoon workshop was about alternate means of getting published–and that’s exactly what we presented. A fellow presenter who is also a friend was promoted as writing a book based on a screen play. And yes, he did speak about that, but then he gave an impassioned plea about being against the death penalty and coming up with some way to rehabilitate young people who have committed crimes. His theme was that anyone can be rehabilitated–something I don’t feel is true–but no one was given the opportunity to rebut. I certainly agree we should have a better plan for rehabilitating any one who crimes and I don’t like the death penalty–but I don’t think that was the forum for that particular presentation. That topic certainly wasn’t presented on the writing workshop schedule. I know the author is passionate about this cause–but not only did he make many uncomfortable, but he also made a few in the audience angry. When he began going over time, I finally spoke up and told him he needed to return to his topic and tie things up as he was infringing on the next speakers’ time. (Granted, the one in charge should have done this, but she was rather overwhelmed by him.) No, I don’t like stepping in like this, but I’m old and seem to be able to get away with being bossy. My point, I suppose is, if you are asked to give a workshop or a speech on a certain topic, stick to that topic–whatever it was you were supposed to do. If you have a particular movement or political passion, find the proper venue to present it. Don’t embarrass yourself or the group that invited you to talk about one thing and then go on and on about something completely different. Once again, I’ll step off my soap box–at least until my next turn on this blog. To be an MWA approved publisher, the publisher must print at least 500 books at once (something most small presses who use print on demand technology don’t do) and give an advance, two things my publishers don’t do though they meet all the other criteria. Though going to mystery cons is an enjoyable experience, they are very expensive. If you can’t be on a panel, your books will not be in the book room. If you’re not on a panel of course no one will be able to purchase your book. For an author, part of the reason to go to a con is to let people know about your book. I’ve decided to only attend mystery cons and writers conferences where I can be on a panel or be a speaker, for several reasons. I want the most for my promotion dollar. I also want to be able to take the trip off my income tax. And most of all, I’m really tired of this discrimination against authors who aren’t published by MWA approved publishers. Another big decision I’ve made is not to pay my next year’s dues to MWA even though I’m a full member–something I’ll never be again once I quit paying my dues. I’ve been a member for years–but they haven’t really done anything for me except to discriminate against me. I get far more out of other organization I belong to such as Epic and the Public Safety Writers Association, and the San Joaquin chapter of Sisters and Crime as well as the Internet chapter of Sisters in Crime. Now I’ll climb off my soap box. If you visit any of these blogs, please leave a comment. This has been a hectic time beginning with the first of September. I’ve done more promotion for this book than any of my others. It began with a preview when I spoke to the San Joaquin chapter of Sisters in Crime, The following week I had the official book launch in Crescent City CA where much of the story takes place. We flew to Illinois where I spoke to the Prose in the Park Writing Conference–and also signed a contract with my new publisher for the next in the Rocky Bluff P.D. series. I attended the Wizards of Words conference in Scottsdale AZ where I gave two presentations. The coming weekend is the Apple Festival in Springville (where I live) CA and I’ll have a booth on Saturday and Sunday. The weekend after that, on October 25th at 2 p.m., I’ll be in Henderson NV (next to Las Vegas) at Cheescake and Crime, a wonderful bookstore giving a talk about what kind of research I do for the Native American information in my mysteries. Whew! And it’s not over yet! I’m already filling my calendar with events for next year too. And sometime, I need to find time to write two more books–yes, that’s what I said, two more books. I have had a terrible time trying to get into this blog. I must be challenged in some way–no matter what I tried, no matter how many new passwords I tried, it just wouldn’t work. Finally, someone must have sprinkled magic dust over my keyboard, because it finally worked. The latest in the Deputy Tempe Crabtree mystery series. It is now available from the publisher at http://www.mundaniapress.com and from any online bookstore or can be ordered from your neighborhood bookseller. It is also available as an ebook. However, since there are other books with the same title, be sure and ask for it as Kindred Spirits by Marilyn Meredith. Tempe and Hutch’s relationship is not going well. A body is discovered after a forest fire and when the detectives learn the woman is a Tolowa with ties to Crescent City, Tempe is sent there to find out what she can about the victim. Another trip to Santa Barbara to seek the murderer puts Tempe in harm’s way. There are some of the stops–if you visit, be sure and leave a comment. This is the most difficult blog for me to keep up with. The reasons are I have to keep changing my password because I can’t remember the one WordPress has given me–it’s way too complicated and haven’t been able to find the place to change it to something I can remember. Then I always have a difficult time actually finding the Book’s Den site. (I know, it’s easy for everyone else.) And I’m supposed to post on a particular day, but I never know what that day is. I probably ought to just give up. I don’t because I said I’d do this post–and I hate to give up on anything. I am extremely busy at the moment preparing for my next Deputy Tempe Crabtree mystery book launch. I’m excited about this one, because there’s a lot about the Tolowa people in it, an Indian tribe that no many know about. Of course it’s a regular murder mystery, but Tempe goes to Crescent City CA as part of an investigation and while there meets some Tolowa women. 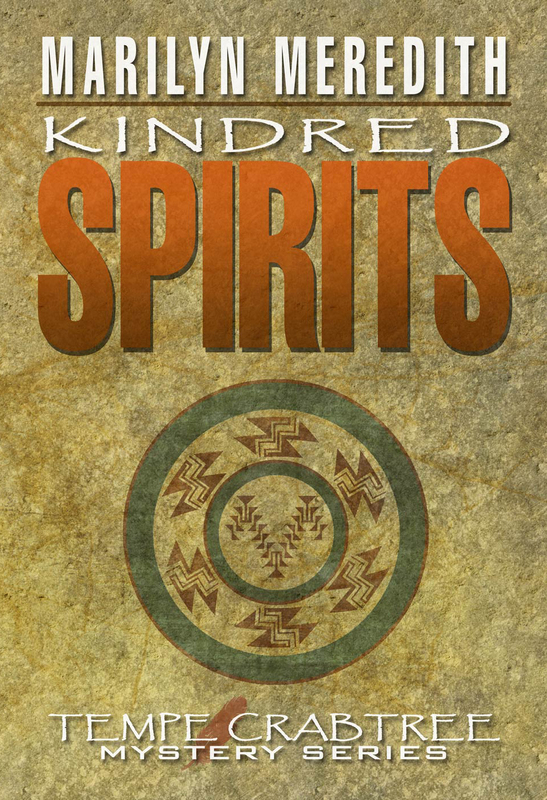 Kindred Spirits is coming from Mundania Press in September. I will be traveling to Crescent City for the book launch. PSWA’s (Public Safety Writers Association) annual conference is being held in Las Vegas, June 18-21, 2009 at the Suncoast Hotel and Casino. The conference is open to anyone writing crime and mystery fiction or non-fiction, technical writing for public safety magazines in print or online, or anyone interested in writing. Registered attendees may offer a suggestion for a presentation or panel. There is no-restriction as to who can serve on a panel. Tim Dees, Editor-in-Chief of LawOfficer.com, after serving in law enforcement, he was the first editor-in-chief at Officer.com before joining Elsevier Public Safety and LawOfficer.com in January 2008. His work has been published in nearly every major law enforcement magazine. His topic for the conference will be: Writing for the New Media. Victoria Heckman, Friday’s Keynote luncheon speaker will talk about “The Journey Is Everything” or “Where The Hell’s The AAA When You Need It?” about the journey to becoming a writer and how it parallels our own life journeys. Logistics of Writing: How to gear up and rev up you writing productivity. A system to layer on top of your present way of writing. A practical series of step that will show you how to switch into a proactive approach of generating work. Authors may bring their books for sale. PSWA will keep 10% to help defray the cost of the conference and for the scholarship fund. There is a price break for members and for non-members registering before September 30th. Membership is open to anyone in any of the public safety fields or writing or interested in writing for or about them. I go to many writing and mystery conferences and confentions, this is my very favorite because of its friendliness and networking possibilities.